Coach Cook's Corner. General McLane Lancer Wrestling. 2005-06 WRESTLER of the WEEK! ( 5-1/11-1) Finished 2nd at the King of The Mountain. Week included 3 pins and 1 major. (8-0/17-4) Went 8-0 at the General McLane Duals. All 8 of his wins were by fall. (4-0/23-1 ) Tool City Champion. Had wins over state placewinners, Corey Slater (4th) & Aaron Nestor(2nd). with his 3rd win over #2 (D10) Dana Goodwill of Corry. (4-0/4-0) Went 4-0 at the Lewistown Duals immediately after returning to the lineup. 1 pin/1 decision. (3-1/19-10) Shawn earned 3rd place at the Seneca Valley Tournament with 1 fall and an overtime win in the consolation finals. (3-0/26-10) Brandon went 3-0. Had wins against Prep & McDowell @ District 10 Duals and a big win over #2 (D10) Clint Copeland vs Conn. Lake. (1-0/29-9) Eric had a big 9-3 win over state ranked (#12 AA) Jeff Langdon at the McLane vs. North East dual meet. (2-0/29-10) 2-0 with 2 falls at the PIAA Team Duals. 1 pin was against Justin McAninch of DuBois (ranked 4th-D9) and the other against Easton's Ju Ju Drummond (state ranked-7th). (1-0/13-16) Brian pulled out a hard-fought, last second, 6-5 win over Fort LeBoeuf's Kurt Lindberg at GM on Senior Night. These five wrestlers won District 10 AAA titles. It was the first time in history that GM crowned 5 District wrestling champs in one year. 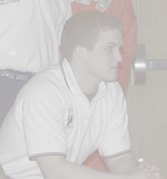 Hadley won the NW Regional title for the third time in his career. He became General McLane's first 3 time Regional Wrestling Champion. Hadley captured 5th Place at the PIAA AAA Championships in Hershey. He also set a new school record for Most Wins in a single season. according to PA Sports Beat! wrestler in the Nation with a 4.0 GPA. Eric Zelina (NR) beat AA #18 Brock Leitzel, Ridgway, beat AA #12 Jeff Langdon, North East, AAA #6 Joe McCullough, Prep, Bobby Steetle #25 AAA Franklin. Brandon Saraceno (NR) beat AAA#17 Adam Steele, G Salem, AA #14 Eric Weaver, Greenville, beat AAA#7 Ju Ju Drummond. Note: Patton from Westmont Hilltop beat brandon 1-0 and he was ranked #12, right behind Steve Waite!). Don Osinski (#8) beat AAA#6 Dillon Evans CRS, AAA#9 Alex Lauffenberger, Warren, AA#9 Colby Pisani Ridgeway, AAA#22 Dan Svec, G Salem, AAA#23 Cody John, Lewistown, AAA#25 Zach Bussard, DuBois. Hadley Harrison (#5 PIAA, #17 Nationally) beat AA#2 Aaron Nestor, Reynolds, AA#10 Corey Slater, Comm Perry, AAA#16 Christian Harr, Holidaysburg, AA#25 Justin Ferguson, Greenville and AAA#24 Cash Horne, beat AAA#13 Zach Lundgren, DuBois. Lou Decker beat (NR) AA#22 Grant McCabe, Freedom. Ashton Osterberg 125 Theil College DIII 0-2 (9-7 record) Update: After a slow start Ashton came on strong, winning 5 of his last 6 matches. He topped it off by taking 3rd place at the John Summa Invitational at Balwin Wallace. Hudson Harrison 157/174 Mercyhurst College DII 4-1 @ SRU Oopen (11-4, 6-8, 13-0, 9-1, 3-1). Hudson took 6th at the Ashland Tourney. He's now a starter at 174. Hudson went 2-2 at the Midwest Classic recently. Update: Hudson picked up back to back wins for Mercyhurst Jan. 29th. He pinned Limestone's Greg Satterfield and beat Heidelberg's Brian Lichty 13-10. Hudson went 2-2 at the NCAA Division II Championships! Ryan Dunlap 197 Gannon university DII. Hayden Harrison 157 Embry Riddel Aer. University NAIA. Hayden went 4-0 at Embry-Riddle Open ..was named the tournaments Outstanding Lower Weight Wrestler. Hayden lost 2 close bouts to the #3 & #5 ranked wrestlers, then went 3-2 at the Las Vegas Tourney (one major/1 pin). Hayden was 5th at Reno tournament of Champions. He went 4-2 w/ 1major and 2 wins over D1 #13 Eric Neil of Central Mich. Hayden went 3-2 at the NAIA-NWCA National Duals and helped his team to a 6th place finish. Update: Hayden was Runnerup at the NAIA Championships in Sioux City, Iowa! Hayden helped his team to a top 5 finish, one of the best in the school's recent history. (2-4 record ) Jake wrestled well but went 0-2 at the Las Vegas Tourney. Branden Stearns 184 Brown University DI Branden went 1-2 at the LasVegas Tourney. Update: Branden went 2-2 at the Lone Star Duals. One of his wins was by fall over Ben Wissell of Purdue, who is ranked 4th in the nation. 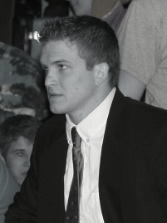 Click here for photos and other information on former General McLane wrestlers in college. * Nick Enders from Titusville was on the team with GM wrestlers at Team Camp. He compiled an 11-0 record with 5 falls. 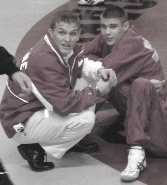 If you are a former General McLane Wrestler, Coach Cook would like to keep in touch with you. Please email Coach Cook your name, address, graduation year and phone number. Mr. Cook would like to start an alumni list, which will be used to send out a G.M. wrestling schedule and other information at the beginning of each season. A Big Thank You to the Lancer Wrestling Booster Club for the finances that paid for the Clinic featuring Coach Jay Robison of Washington and Jefferson College, formerly a 3X All American at Edinboro. This was a invaluable experience for our wrestling team!! !